Smokey styled dinnerware that is guaranteed to be break resistant and durable for years of service. 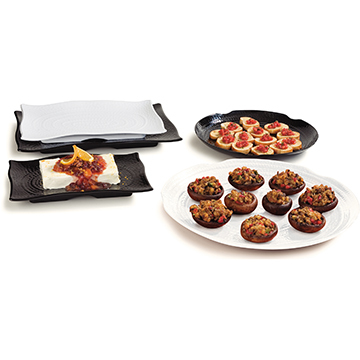 Carlisle Terra melamine dinnerware is recommended as excellent outdoor dinnerware due to its shatter resistant material and aesthetic that can fit seamlessly into any setting. Carlisle 4452402 Terra White Rectangular Textured Plate 18"X12-1/2"
Carlisle 4452403 Terra Black Rectangular Textured Plate 18"X12-1/2"
Carlisle 4452202 Terra White Rectangular Textured Plate 15-1/2"X11"
Carlisle 4452203 Terra Black Rectangular Textured Plate 15-1/2"X11"